People attend 'Helsinki Calling' protest ahead of meeting between the U.S. President Donald Trump and Russian President Vladimir Putin in Helsinki, Finland July 15, 2018. As U.S. President Donald Trump and Russia’s Vladimir Putin prepare to meet in Helsinki on Monday, thousands of Finns took to the streets. 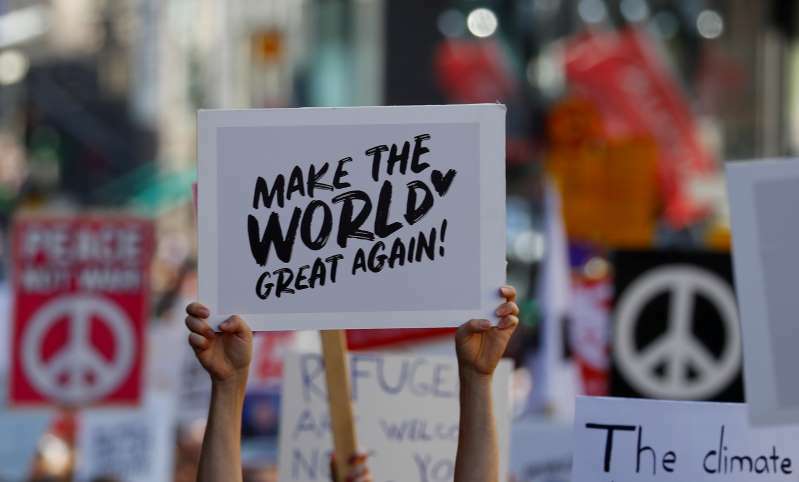 [post_ads]About 2,500 people marched in the Finnish capital on Sunday, behind a banner that read “Helsinki calling for human rights.” The country’s biggest newspaper, Helsingin Sanomat, had arranged for the words “Mr. President, welcome to the land of the free press” to be displayed across the outside of the main airport, in English and Russian. Trump’s European trip has been dogged by mass demonstrations. In London, tens of thousands of people marched under an effigy of the U.S. president in balloon form, depicting him as an orange baby. In Scotland, where Trump took a break between official visits to play golf at one of two resorts he owns in the country, there were protests in Glasgow and Edinburgh.